Jin Liu 刘津 is currently Associate Professor of Chinese Language and Culture in the School of Modern Languages at Georgia Tech. She received her Ph.D. in East Asian literature and culture from Cornell University (2008) and her M.A. in Chinese linguistics (2000) and B.A. in Chinese language and literature (1997) from Beijing University (PKU). Her interdisciplinary research studies contemporary Chinese popular culture from the perspective of language, writing, sound, voice, and music. She is the author of the book, Signifying the Local: Media Productions Rendered in Local Languages in Mainland China in the New Millennium (2013). Drawing on cultural and literary theories, media studies, and sociolinguistics, this book examines recent cultural productions rendered in local languages and dialects (fangyan 方言 in Chinese) in the fields of film, television, the Internet, popular music, and fiction in mainland China. She co-edited and contributed to the book, Chinese Under Globalization: Emerging Trends in Language Use in China (2012), a concerted effort to present a scholarly, panoramic view of linguistic struggles and linguistic politics in China’s reform years. She has published articles in journals including positions: Asia Critique, Modern Chinese Literature and Culture, Twentieth-Century China, Journal of Modern Literature in Chinese, Chinese Language and Discourse, and Harvard Asia Pacific Review. Dr. Liu teaches Chinese language and contemporary Chinese culture at Georgia Tech. 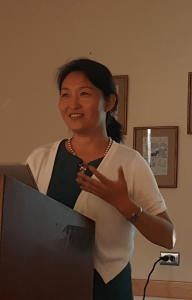 Earlier she taught Chinese language and culture at Cornell University, Middlebury College summer Chinese school, and Princeton University summer program in Beijing (PIB). She alternately co-directs the GT School of Modern Languages’ intensive summer Chinese language program in Shanghai and Qingdao, Chinese LBAT. She is the coordinator of the prestigious Chinese Government Scholarships (each about $10,000) since 2011. She has organized two China events for Georgia Tech Global Media Festival, and brought the awarded film director and photographer, Mr. Wang Jiuliang, and the comic artist Mr. Li Xiaoguai, an icon of Chinese youth culture and Internet culture, on campus in 2017 and in 2018. Dr. Liu received the Georgia Tech CETL/BP Junior Faculty Teaching Excellence in 2012, the Class of 1934 Course Survey Teaching Effectiveness Award in 2012, and the Class of 1940 Course Survey Teaching Effective Award in 2014 and in 2018. Her current research topics include the newly coined Chinese characters on the Internet, the mute characters in films of traumatic history, and public toilet in contemporary Chinese popular culture. In her free time, she enjoys singing, practicing Taiji, travel, cooking, gardening, biking, or walking with their dog, Peanut.